Would you like to hear Billy Joel and Elton John live, playing for free, at a cozy bar in Baltimore’s Mount Vernon neighborhood? 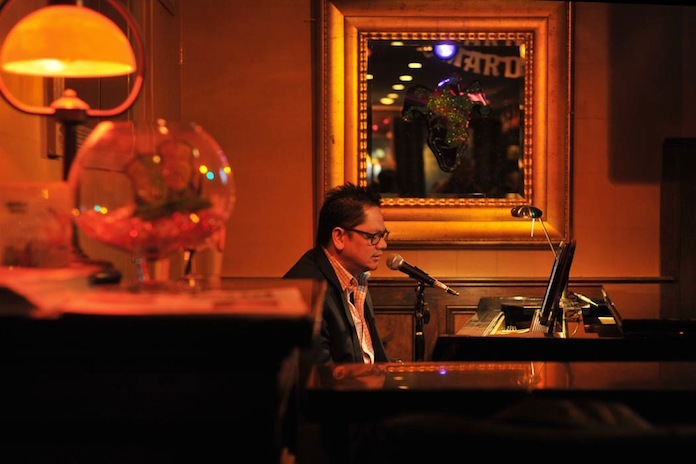 Okay, you can’t, but you wouldn’t know it if you walked into Jay’s on Read on the night Leonardo (Leo) Cagape plays and sings the songs of Billy Joel, Elton John and some of the greatest songwriters of the last seventy years. Leo is that good. The range of the songs he plays is phenomenal – from Gershwin to Leonard Cohen and more. He’s also an accomplished pianist, both as an accompanist and as a jazz instrumentalist, and a singer with a powerful yet sensitive voice, that can soar at one moment and become soft and expressive at the next. See and hear him online and judge for yourself. His rendition on YouTube of Billy Joel’s “She’s Always a Woman to Me” is stunningly beautiful and sounds astonishingly like Billy Joel himself. And it’s even more real in person. I discovered Leo at Jay’s on Read a few months ago when I was searching Yelp for a place to hear good piano-bar music in an intimate setting. 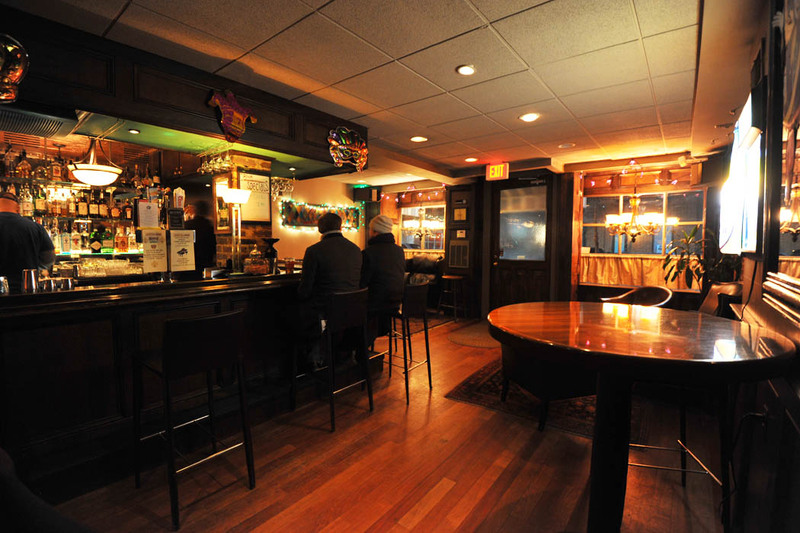 In Jay’s I found the ideal place: a quaint neighborhood bar with real brick and wood walls, festooned with campy decorations under the soft glow of dimmed lights. All around, the pleasant murmur of quiet conversations emanated from small groups of bar denizens thoroughly enjoying themselves in a state of alcohol enhanced good cheer. But what I found in Leo’s music far exceeded my expectations. Listen to Leo and let the music move you and take you through memories and emotions, former and present loves, dreams and fantasies – until the evening ends and you awaken from the lovely trance he has put you under. If you love romantic, heartfelt songs and ballads, come hear Leo, and try to sit close to him to minimize the distractions of the bar scene. If you love music that absorbs you with the feelings of the story it tells, come hear Leo. I always come away from an evening of his music a little happier, and a little sadder, but always pleasantly emotionally spent. Leo has lived in Baltimore since emigrating from Manila seven years ago. He works as a shipping clerk, and lives in Linthicum Heights with his wife, Beth, and their three children. He possesses a disarming child-like earnestness and innocence that makes him appear far younger than his actual age of 39. He’s soft-spoken, serious, and reserved, even shy, and he gives the impression that he doesn’t realize how good he is: such a humble guy for such a big talent. Yet he is friendly and personable once you get to know him a little. But until you hear him play and sing, you would never know from his appearance and demeanor how moving his music is, and how much feeling it conveys. I caught up with him recently at Jay’s on Read. When did you start playing music seriously? You were playing music before then but not professionally? Who were some of you biggest musical inspirations? I know you like Gershwin. Who were some others? I love Tony Bennett, how he sings, even at his age now. In songwriting, I love the works of Michel Legrand. Billy Joel is also a hero to me ‘cause he can write songs and he’s a really good pianist. You seem to channel Billy Joel. You really have him down. Is that something you consciously do? I know you’ve posted your version Billy Joel’s “She’s Always a Woman to Me” on YouTube. Did you see some of the responses you got? They were very enthusiastic. I mean they were raving about you. Yeah I just came to realize that. I don’t know if I have regrets, but I’m 39 years old, and I’ve been away, it’s like I’ve been hiding on cruise ships. I should have had an album, I should have, in the Philippines, tried to go to a label and ask if I could become one of their artists. That’s something I still want to do, have my own album. Why didn’t you record an album? I was too busy going back and forth on cruise ships. I was mostly an accompanist on the cruise ships. I went solo later. [But] When I put my videos on YouTube [and saw the response they got] I realized I have a voice I should be proud of. Did you ever think of getting a manager or an agent? Yes, that’s one of the things I want to pursue. I had a chance, when I was playing on a cruise ship in Singapore. There were a group of people who came on-board, they were in the entertainment business in the Philippines, and they heard me, they were famous musicians and promoters in the Philippines, they heard me, but for some reason it didn’t work out. When I went back to the Philippines, I didn’t call the number they gave me. I was going back to the cruise ship. I didn’t have much time. I see. Getting back to the present, do you play with a group? When I saw you at the benefit (for the victims of typhoon Haiyan) you were playing with a group. Is that your group? No, we were just jamming. But in 2010 I joined a band, from Washington D.C. The name of the band was “Black Tie Band.” It’s basically a wedding band. They’re famous around D.C. I played with them for about one year. But I had to quit to help care for my youngest daughter, who was very young then. The group had a lot of gigs around D.C. and we played a lot. The Washington Talent Agency still calls me sometimes for solo gigs, in hotels, once in a while. How do you keep up your technique? Yes, I practice at home a lot. I learn new songs from CDs, and from music sheets. When you hear a new song that you like, how long does it take you to learn it well enough to play in public? If I really like the song, about 2 days usually, by listening to it and playing along with it. Do you have any compositions of your own? I only have two songs. I don’t play them in public but I recorded them at home. To have an album. To hear myself on the radio. I’m not into being famous. I just want to be recognized as a singer, a musician who can sing and is a pleasure to listen to. Since I have a YouTube channel, now that I have 700,000 views, many are asking me if I have my own songs that they can buy. It’s hard to answer that. I might make an album and sell it over the internet. You can do that nowadays. But to do that I will need collaboration with a good lyricist, because English is my second language. I’m not really good at writing English songs, English lyrics, but I have a lot of melodies in my brain. At events – private, corporate, once in blue moon. You play a variety of styles, ballads, love songs, of the 40s through the 80s. And jazz numbers as well. Do you play rock and roll? Yeah, I’m open to any kind of music. I once became a keyboard player in a famous Ska band in the Philippines. What attracts you to the music you play here at Jay’s? I just love those songs. Those American standard songs, from the 30s too. Did you hear that kind of music in the Philippines? No. I learned it in the cruise ships. The musical director was a really good pianist. And he was so kind. He taught me lots of things about how to play jazz music. What’s it like playing here, in a bar scene, where some of the people are into the music and they appreciate it, but a lot of people are just here to drink or to talk, and they’re not really aware of how good you are, and how much feeling you put into the music. Is that disappointing, or do you just play for the people who really enjoy listening to you? Yeah, it inspires me when people are digging my music, and it doesn’t matter if some aren’t listening too much. The people who enjoy listening to me. And for myself too. Sometimes I’m nervous before I start playing, but I feel good after playing for four hours. How do you play the same songs over and over and make them sound as if you’re playing them for the first time? How do you keep them fresh? How can someone who reads this article contact you or hear a sample of your work or to hire you for a private event? Contact my email account, leopiano2001@yahoo.com. You can also find my Facebook and YouTube channel by Googling my name, Leo Cagape.